What in the World Are Those QR Codes? QR is short for quick resource code (QR code), the scannable geometric-looking design that connects a person via smartphone or digital device to online information such as an e-mail site, a video, a website, or even a telephone number. QR codes are similar to bar codes, but the QR image contains far more encoded information — thousands of times more, in fact. Learn more about QR codes at the Common Craft video tutorial site. A QR code is essentially a shortcut to digitized information. It might be, for instance, at the end of a book chapter, linking the reader to more content on a topic, or perhaps on an advertisement or billboard. It could link conference attendees to a workshop handout or schedule. To read a QR code, a person opens a scanning app, or QR reader, on a smartphone and aims the scanner at the QR code. The app functions as a combination camera and scanner. It scans the image and quickly links the user’s smartphone to the site. Many free QR code reading apps are available for downloading on iPhone and Android smartphones as well as BlackBerry phones. On my phone I have installed QR Reader for iPhone. The app is also available for Android. QR scanning apps usually have ads. When I see a code that I want to “read,” I open the app on my phone, point my phone at the image, and then adjust the camera’s position until the QR code is within the bracketed corners. Once the QR Reader frames the image inside the brackets, the app automatically scans it and connects my phone to and opens the information. Check out the screen image of my QR reader app (above right). Anyone can make a QR code and use it to direct others to digital information. Simply copy the URL (the web address where the information lives) and paste it into a QR code generator. A generator that I’ve used is QRStuff.com, but there are plenty of others. 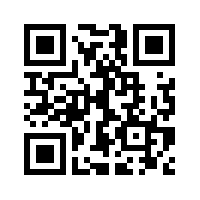 For example, to make a brand new code I used the website address for an FAQ on QR codes. I put the address into QRSstuff.com and generated the QR image on the left — a shortcut that leads to the FAQ. QRStuff also lets a user pick a color for the coded image. Quick resource codes are everywhere, and they are becoming more common. In Boston this week I counted the QR images that I could see from my subway car seat during one ride — seven. More interestingly, in the short train ride between North Station and Copley Square, five stops if I recall correctly, I observed three people aiming their smartphones at the QR images. Thank you for a great post about the possibility of QR code, it is very useful information for me. « Just Where Is That Fountain of Youth?